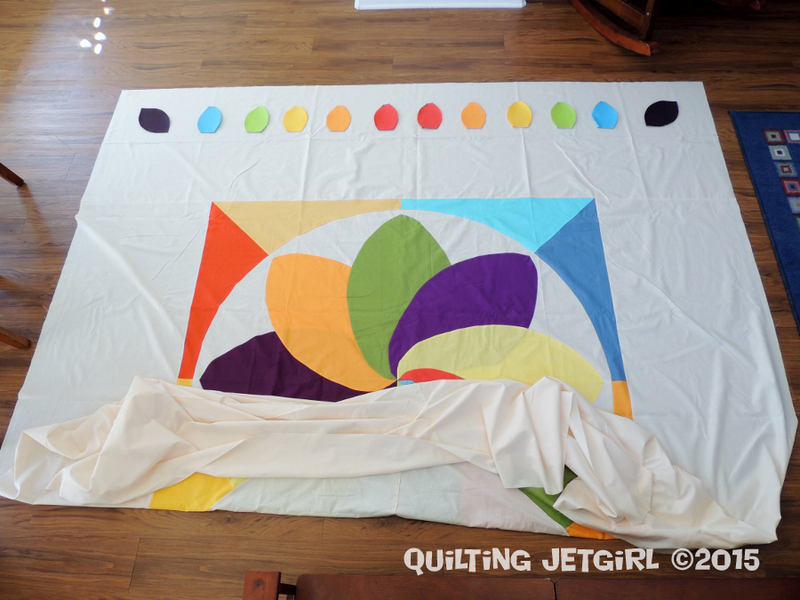 After finishing the piecing and applique for the center of the Cocoa Leaf Medallion Quilt, the next step in the process was to expand the quilt top out to its final, over-sized queen dimensions. It now measures 103-inches wide by 122-inches long! The final step in piecing the top together is adding on smaller applique cocoa leaves to create borders around the sides. Fine tuning the color arrangement and placement has taken time and attention to detail, and as you can see below, the final choices were quite subtle. 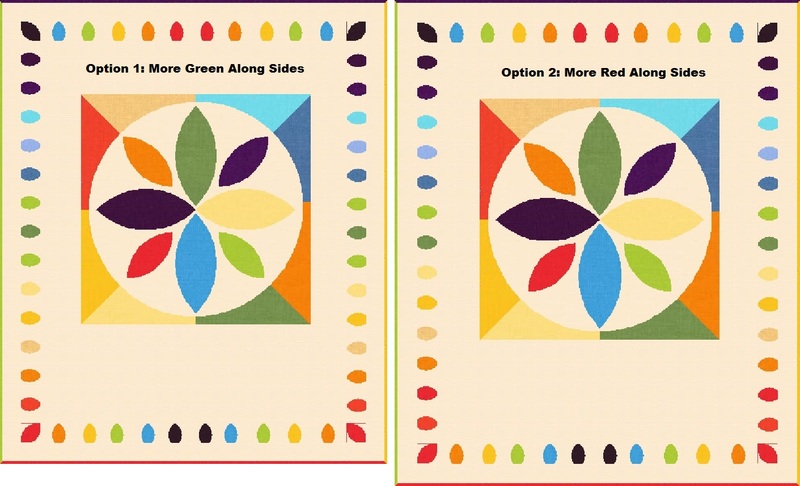 I am so glad that my customers are so involved in this process, as I would not have ended up at this design without all of their input (they chose option 1 with more green, by the way). Creating the templates for the border cocoa leaves, cutting, and pressing the top row took 1 hour and 15 minutes. My plan is to work one side at a time (cut, press, layout, pin, sew). I spent another 1 hour and 30 minutes evenly spacing, carefully pinning down, and sewing the upper cocoa leaf border. 12 border leaves done, and 38 to go! Linking up to WiP Wednesday and Let’s Bee Social (buttons on the right). This is looking great. I really like those little leaves in the border, though that’s a lot of careful stitching ahead of you! It’s been a long time since I’ve had a design floor that could accommodate a queen. The quilt is looking good! Didn’t realize it was going to be a queen sized quilt. That’s a lot of appliquéd leaves to sew but it’s looking great. Wow!! This is looking amazing! This is awesome. Hope to see the quilting. I really like how the overall composition is coming together. The negative space frames your center nicely, and those leaves hold it all in perfectly. I’m excited to see how you quilt it! It’s coming together so nicely! Those cut off cocoa leaves kind of drive me crazy, what was the reasoning behind that? Maybe once I understand they won’t bother me, haha. Looks brilliant, glad you have the floorspace for such a big quilt. Like the more green option too! Yvonne, curious about the mechanics of the project. Would it have been simpler to cut a border strip and place the smaller leaves on that and applique, rather than directly on the large quilt? I am wondering how you decided to construct it this way. It is a striking quilt top and one that will make your customer really happy. Just wondering. Looking forward to seeing it all quilted up. I love seeing your progess! This is fabulous and it is so nice when customers let you be creative! Wow! That is one bright, happy quilt. I’m sure the recipients will be thrilled! That is practically king size. Wow! It is looking great. I didn’t realize the medallion was so large. 🙂 The borders add a lot. Happy appliquéing. Wow! That’s quite a large quilt! Is it just the angle of the pictures, or is the ‘center block’ closer to the top of the quilt than the bottom? You’re going to have some great white space to play around in! It looks awesome, I love the version they picked, but the red was great too. It is going to be a beautiful quilt. It is looking great Yvonne. Soon you will be having fun quilting it! wow. This will be absolutely lovely! 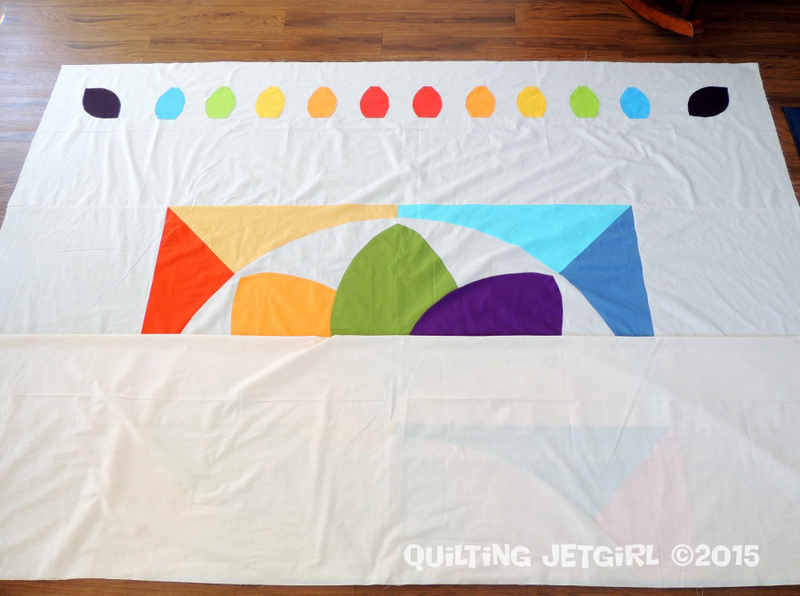 I think those border applique pieces will really pull it together – but what I’m most looking forward to now is seeing how you quilt all that white space! Oh what fun this quilt is! I especially love the different colored border around the medallion – super cool! This is a really fun design. thanks for sharing. Looks like it’s coming along great! How did you organise the price with the customers? I know you have a per hour rate but were you able to estimate to them how long it would take to make? 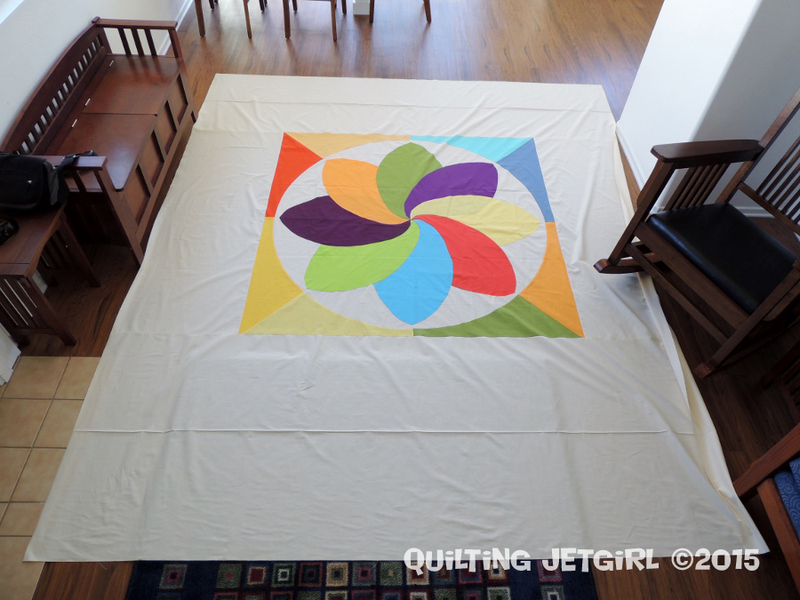 It seems so different from your other quilts! I think that’s why I’m wary of putting myself “out there” to make custom quilts because I don’t want to tell someone it will take 20 hours if I end up taking twice as long to put it together. You’re making great progress! I bet your customer is thrilled with how fabulous it looks! So cool! I can’t wait to see it finished! How are you quilting it? It is looking great. Lovely project and I’m sure your quilting will take it one step further. I love this look with the central block surrounded by negative space and then repetition of elements in the border. I’ll be looking forward to your plans for the negative space. Good thing you have lots of floor space! I have been loving being able to watch this quilt grow into life. It is looking more and more beautiful than graphics can ever give a quilt! 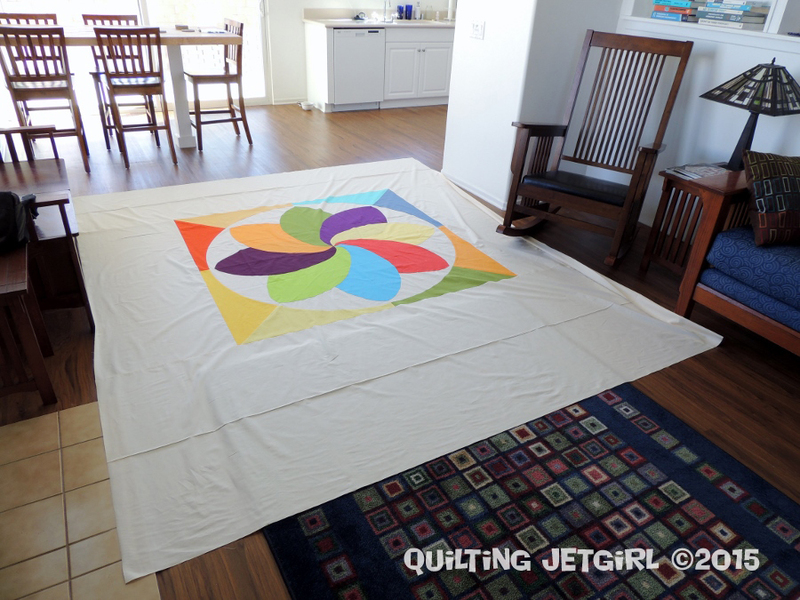 This is such a large quilt, too!